The reality of plastic pollution is that it is happening in every home, office, school and community. It’s plaguing our country. Plastic creates toxic pollution at just about every stage of its existence, from manufacture, to use, to disposal. Considering the facts, it’s no surprise that it’s the most prevalent type of marine litter worldwide. The extent of plastic use is mind-boggling. Take plastic bags for instance. Americans go through about 100 billion plastic bags a year. That’s 360 bags for every man, woman and child in the United States. And, less than five percent of these bags are recycled. Bottled water waste isn’t much better. It is estimated that the worldwide bottled water industry sells 50 billion bottles annually, with the United States responsible for 30 billion, or 60 percent, of them. Did you know that on average, 1,500 bottles are consumed every second in the United States? Yes, it's true. Bottled water alone accounts for up to 1.5 million tons of plastic waste every year, 80 percent of which ends up in our landfills and ocean. More importantly, plastic does not biodegrade. Once in the ocean, it breaks down into smaller and smaller particles until it’s so small that it’s mistaken for food by marine life. Every year, countless birds and animals die after ingesting plastic trash. When these plastic particles enter the food chain, they often end up on our own plate. Just imagine how much of these microplastics we are ingesting. And despite all these facts, why can’t we give up the convenience of plastics? Bad habits are hard to break. With this in mind, the Surfrider Foundation created its Rise Above Plastics program in 2007 with a mission to reduce the impacts of plastics in the marine environment, raise awareness about the dangers of plastic pollution, and advocate for a reduction of single-use plastics and the recycling of all plastics. Since its inception, several tools and resources have been created for Surfrider activists around the country to help break these bad habits and address the issues in our daily lives and communities—all the way up to the federal level. Surfrider Chapters are currently working on 27 Rise Above Plastics campaigns around the country, with a total of 76 victories since 2006. This doesn’t include the dozens of beach cleanup events and projects our 84 chapters host every month—cleaning up tons of trash and plastic debris. A few Surfrider chapter victories in 2014 include the first-ever statewide single-use plastic bag ban in California and numerous bag ban victories in Hawaii, Texas, and Washington, DC. Our chapters are working vigorously to pass bag ban bills in Florida and New York as well. Our Washington D.C. Surfrider chapter and TrashFree Maryland banned “Styrofoam” (expanded polystyrene or EPS foam) in Washington D.C., while the Hawaii Oahu Surfrider Chapter is continuing work on passing Bill 40 to ban EPS foam food service containers on Oahu. Surfrider is part of a large coalition of groups, including 5 Gyres, Clean Water Action, Heal the Bay, Sierra Club, Environment California, that are working to educate people about the environmental harms and health risks of single-use plastics and EPS foam. We’ve also partnered with ChicoBags, Billabong, Aveda, and Native Foods: companies leading plastic reduction initiatives. While we’ve come a long way in reducing the amount of plastic being dumped in our oceans, waves and beaches, there is still a lot of work ahead. We must continue our fight to implement change through legislation, but we cannot simply wait for it. We must address the issues as they arise in our daily lives. Here are a few ways to Rise Above Plastics, break your bad habits and practice the four “Rs” on plastic use: Refuse, Reduce, Reuse and Recycle. Forget bottled water. Carry a reusable bottle. Plastic bottles are one of the top-five most common types of litter found on beaches. Since bottled water is much more expensive than tap water, you’ll also save money and avoid the possible hazards of plastic toxins leaching into your beverage. Avoid buying items packaged in plastic. Look for produce and other items that aren’t over-packaged. Not only are you reducing the plastic you use, you’re sending a message to the manufacturers of those products that you prefer sustainable packaging. Volunteer at a beach cleanup. Help pick up plastic debris that have already reached our coasts to make certain they are recycled and not mistaken for food by birds and marine life. Surfrider Foundation Chapters are holding events all month long. 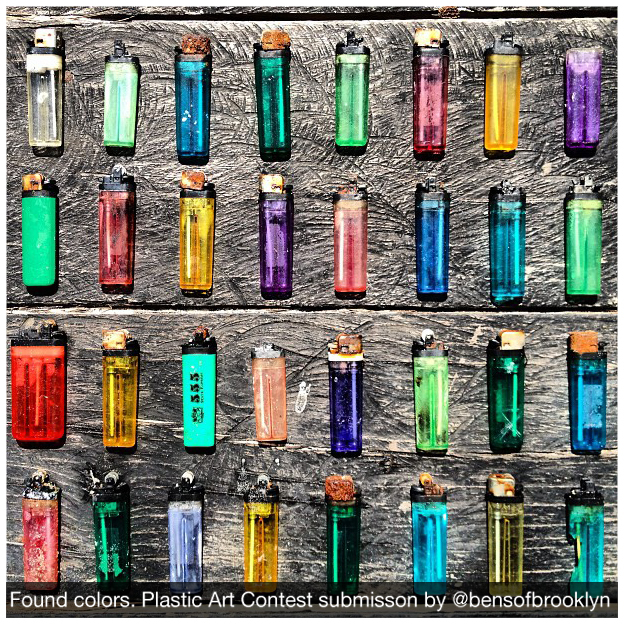 Collect trash, then enter our Rise Above Plastics Art Contest for a chance to win some amazing prizes. Take Surfrider’s Pledge to Rise Above Plastics. Learn more ways to make simple changes to your daily routines by taking this Surfrider pledge. Then spread the news and share it with your friends. Make a donation. Every drop counts. Your support is crucial in ensuring the continued success of Surfrider’s campaign and programmatic work, including more than 27 Rise Above Plastics campaigns taking place across the country today.